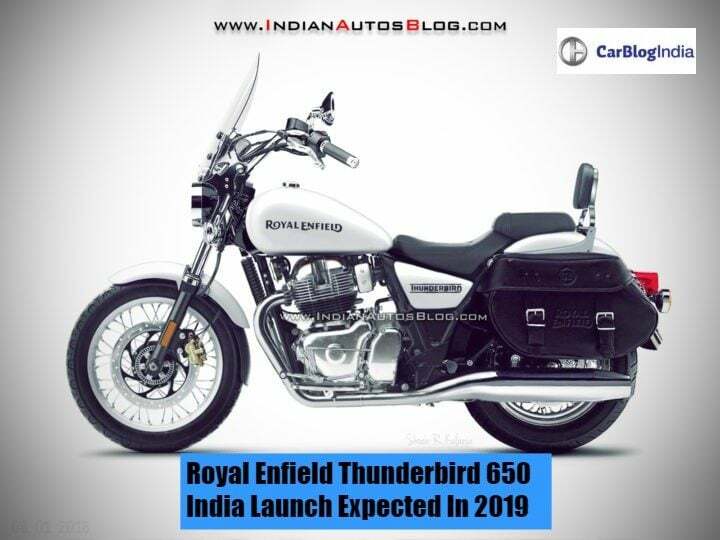 Check out the speculative rendering with the Royal Enfield Thunderbird 650 with its expected price, expected launch date, specs, and more details. The chances of 650cc Thunderbird is possible as already 2 RE bikes are getting new 650cc engines. Read ahead to know more. Royal Enfield Thunderbird 650 is speculated to launch sometime in 2019. There are no official or any hints were given by RE, but various reports also support it. RE bikes have always managed to capture the heart of various bikes around the world. It is one of the bikes which looks the best with classic retro looks. Currently, the most powerful bikes from RE in India have 500cc engines. The Continental GT 650 and Interceptor GT 650 are scheduled to launch in September. However, a need for a 650cc variant in the Thunderbird series is always felt. If launching, it might be priced somewhere around Rs 2 Lakhs (ex-showroom). Check out all our expectations in this speculative story below. It is said that production of the new motorcycle will start in 2-3 months and is expected to launch by the end of 2018 or early 2019. The launch of the new Thunderbird will follow the introduction of the new 650 CC twins. Interceptor INT 650 and Continental GT 650 will mark their debut at the Auto Expo 2018. The 650 CC Interceptor has just made its public debut at EICMA in 2017 and will first go on sale in Europe. Subsequently, it will also launch in India, where it is likely to come around by May next year. Royal Enfield has promised its fans that the new 650 CC motorcycle will launch in all the markets where RE has a presence by June next year. The new 650 CC cruiser motorcycle from Royal Enfield will launch in many markets across the world. In a highly price sensitive market like India, where the selling price plays a huge role in the buying decision, it gets really important for companies to have an ultra-competitive price. Prices are likely to be kept around the Rs 2 lakh range. The new Royal Enfield Thunderbird 650 will gets its engine from the Interceptor. The new Royal Enfield comes with a new 650cc parallel-twin engine that looks a lot like another RE parallel twin of the yore. However, the new motor is a thoroughly modern unit and offers a peak power of 47 PS at 7,000 RPM along with a maximum torque of 52 Nm at 4,000 RPM. The engine will be mated to a 6-speed manual transmission and has a SOHC head. The oil-cooler for the engine features a small radiator that is mounted on the double-cradle chassis. The cruiser is likely to get the features which are not much different from the other Thunderbird siblings in the market. It might get the Dual-Channel ABS with front and rear disc brakes. Other features will include an Engine Kill Switch, LED Always On projector headlamps, full instrument panel with digital trip meter and low fuel oil and side stand sensors. Royal Enfield makes classic old-school cruisers and cafe racers and most of its buyers do not see its features. Just the looks are enough for this bike. In terms of designs, there would be no major changes if compared to the current Thunderbird models. It would likely get some decals or some minor cosmetic changes like a new color scheme, optional windscreen and an optional storage compartment. Mostly, there will be only major mechanical changes. So, are you waiting for the launch of the new Royal Enfield Thunderbird 650? Share your views with us by penning them down in the comments section below. Stay tuned to Carblogindia for the latest news on cars and motorcycles relevant to the Indian market. It will have no direct comparison as such because the pricing is too less and it is much powerful. However, it might go against UM bikes. Harley and all the other premium bikes are priced nearing Rs 5 Lakhs.